Sunpenny Publishing Group: E-Book Promotion: Dance of Eagles by J.S Holloway available for 99p this week! E-Book Promotion: Dance of Eagles by J.S Holloway available for 99p this week! 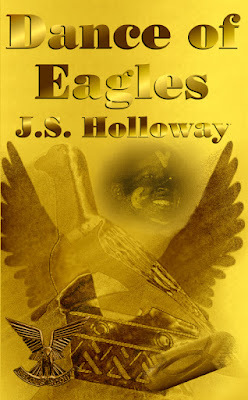 To celebrate the e-book release of the explosive action-thriller Dance of Eagles by J.S Holloway , we are offering it at only 99p from the reduced price of £4.11 on Amazon Kindle! An explosive adventure-thriller set in 14th-century Africa, and in the 1970's bush war of Rhodesia-Zimbabwe. Powerful characters who shaped their worlds, interwoven into a vivid tapestry that melds two stories: Tcana, daughter of a cattleherd, wife of a prince, high priestess of a new religion that will rip apart the ancient city of Tsimbaboue in the 1300s; and American TV journalist Rebecca Rawlings, caught up centuries later in the remnants of Tcana's faith and a violent war of attrition –Rhodesia, during the 1970s. Peter Kennedy, commander of the famed Selous Scouts. His friend and right-hand man, Kuru. And Kuru's brother, Mandhla, trained as a top flight freedom fighter by the Russians. In this gripping tale of love and retribution, Mandhla stalks the woman he sees as the key to his revenge, as surely as Peter and Kuru stalk the man known only to them by his nom-de-guerre: the Mamba. "The narrative is fast-paced and crisply told. ... never forgets to keep her stories moving, alternating between historical eras and geographical locations swiftly. She writes with clarity and style. Above all, her novel melds many universal themes - love, hatred, religion, fear and rebellion - into one insightful, compulsive narrative." "An intriguing story, in which the author relays the setting with such clarity and expression that you feel you must immediately book flights to see all these beautiful places in Zimbabwe! I enjoyed the way the book bounced from present to past, where we got to see the lives of two women so far removed from one another's circumstances, yet their lives are intrinsically linked. The story grips you right through to the last page... and the ending leaves you wondering if there will be a sequel." Remember that even if you don't have a Kindle, you can still download the e-book to read on free apps for PC, Android and many other platforms from Amazon. Happy reading and don't forget to spread the word about this limited time offer!